Call A to Z Entertainment, Inc. today for free information about how to hire or book musical variety show The New Odyssey. 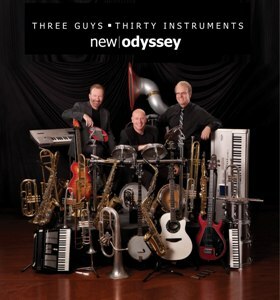 With over twenty years of successful experience, we are your best booking agency for hiring the musical comedy act and dance band, The New Odyssey! We can also help you plan or produce your shows and events if you like. So call us now at 888-655-4575 and we’ll be happy to help you. Here is an act that is versatile, funny, novel, talented, polished, family-oriented and awesome in presentation. New Odyssey has been together for over 20 years and has performed at literally thousands of functions, always to complete satisfaction and rave reviews! This is a show you must see and hear to believe. The New Odyssey experience is all encompassing. Outstanding arrangements of almost every style are performed on 30 different musical instruments! With a unique combination of great music, audience participation, and sheer zaniness, mayhem can ensue at any moment. The New Odyssey band, cooperative and always punctual, will set up long before the first guest arrives with all of the musical, sound, and lighting equipment needed to present a memorable performance! You need only to look at New Odyssey’s impressive client history to know this is truly a #1 show! Keep in mind that New Odyssey is your leading choice to supply live, first-class music for dancing. With a huge, kicking sound and vast array of dance music spanning five decades, New Odyssey has the ability to adapt to almost any function, and any audience. Discover why the New Odyssey band is the secret to ensuring your successful event. Relax and take the stress and guesswork out of finding the right act. New Odyssey is your ultimate entertainment package! Having helped hundreds of clients, we are your best agency for booking and hiring the musical variety comedy act, The New Odyssey! We can help you book or hire any type of dance bands, variety shows, and musical comedy acts. So call us at 888-655-4575 today and we’ll be glad to help you! We are not the exclusive agency of any live musical entertainers on this site, but we’re the best.